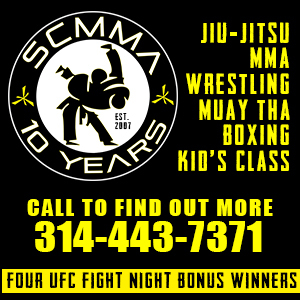 It was the first of a busy 2019 for the Nemesis Fighting Alliance that will see the promotion run four events at the Casa Loma Ballroom in downtown St. Louis. An unfortunate weight cutting adventure for Chuka Willis saw the fighter pull out of his second fight in less than a month leaving Sean Woodson without an opponent for Saturday. Willis was forced off the Fight Hard MMA card in March for taking a short notice boxing match the week prior, and wasn't medically cleared to compete. Sliding into the main event slot was a kickboxing match-up with the highly touted Drew Gigax facing Moldova by-way-of Cape Girardeau's Ghenadie Bitco. Bitco, representing Gladiator MMA, brought a strong competition pedigree to the cage with him on Saturday night. Gigax recently moved camps to the KBC Garage, training under Quinton O'Brien. The two welterweights traded shots early, both patient and waiting for the other to make a mistake. Late in the round Gigax connected with a headkick which dazed Bitco. In the second round Bitco came out hungry for blood with a pair of round kicks and an axe kick that narrowly missed the shoulder of Gigax. After a brief clench against the cage, the taller Gigax seemed to connect with a short elbow that badly hurt Bitco who turned to escape. Gigax was quick to pounce and landed a punch that dropped Bitco to the canvas. Bitco couldn't answer the count and the fight ended at 1:23 in the second with Gigax scoring his third professional kickboxing victory. The other pro fight on the 15-fight card was the professional MMA debut of Josh Augustine out of St. Charles MMA facing Bitco's teammate Brandon Ditterline. The two featherweights sparred on Facebook a bit before stepping into the NFA cage, and when the action began it was Augustine who came out the aggressor. Augustine looked for the takedown early, sitting in half guard, content with working his ground and pound. After unable to get any through, Augustine transitioned to a standing position still inside Ditterline's guard where he punched from the top, but Ditterline's defense held and he was able to absorb the offense. Relentless with his pursuit, the punches started to add up. With Augustine sensing a finish, he turned up the intensity on the elbows and finally got the ref stoppage at 4:20 in the first round. Late replacement Richard Moad took on Dan Liberson in the second of two amateur title bouts. Moad has nearly 60 amateur fights to his credit, but Liberson was the clear favorite. Once the action began it was clear Moad wanted to fight this fight on the ground as he committed heavily to an ankle pick, but Liberson was able to hold him off. After forcing a scramble, it was Liberson who ended up on top, taking the back of Moad who was facedown on the canvas. With Moad unable to escape, Liberson flatted out his opponent and started landing heavy leather from top, before the ref stepped in and waved off the fight. Liberson improves to 6-0 picking up the NFA amateur title in the process. Going into the fight Liberson was the #4 ranked Missouri/Kansas lightweight, and surely his rank will rise adding gold to his trophy case. Kicking off things on the main card was a flyweight title match featured Steven Wilkinson and LC Hamid. Unfortunately, Hamid could not reach the flyweight weight limit of 126 and was ineligible for the belt. This one was all Hamid, with the flyweight form Watson's landing a wicked punch to the ribs that immediately dropped Wilkinson to the canvas and signaled the end of the fight. Hamid wins by TKO in just under a minute to win his third in a row. In the only women's bout of the night, Nora Schull and Liz Helton traded a variety of offense in a women's kickboxing match-up. Both landed often, but Helton seemed to control more of the cage and kept her energy throughout the bout, and when the fight went to the judges, Helton was a unanimous decision winner. Tyler Horton and Patrick Keao battled to a near stalemate last December with Keao winning by split decision in a kickboxing match-up. The two decided to run it back, the Promoters agreed and the two laced them up for a rematch. When the bell rang, the two picked it up from where they left off with both fighters scoring. Horton came out landing a high percentage of strikes in the first minute, seemingly the more accurate puncher early, but it was Keao's kicks that started to swing momentum in his favor. A good show of sportsmanship in the third with a friendly hug between the two competitors setup a back and forth third round with both fighters leaving it all in the cage. When the bell rang, the fight went to the judges and it was once again a split decision. After a long deliberation, Keao is awarded the victory, gaining his second win over Horton, in another classic affair. Michael Manning wasted little time in his bout with Bryan Barkau. Manning got the takedown and worked to pass. Barkau re-guarded his opponent and from there Manning scored a brutal elbow that turned out the lights of Barkau, the fight was quickly stopped and Manning's hand was raised. 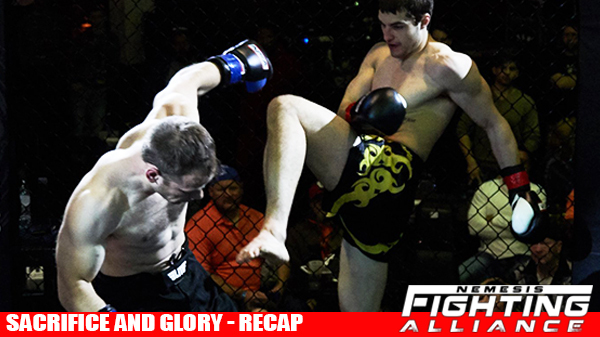 Trent Gibson defeated Brendan Wolf in a grapple heavy bout, with both fighters maneuvering for dominance. Despite Gibson landing punches form guard, Wolf was able to survive the onslaught for three rounds where Gibson was awarded a unanimous decision. Keegan Irish took the back of his opponent and finished with a clinical rear naked choke. Johnny "Buckets" Brannon edged out Anthony Priest in a kickboxing match-up. Brannon landed a few more punches and ended the rounds with flair to take the judges decision. Ian Durst was dominant in his first round TKO victory as well as Maclom Elzie who took a judge's decision. Hieu Vuu was a surprise standout in a preliminary match. The flyweight out of River City Warriors is one to keep an eye on as he was active on his feet and on the ground, cruising to victory in a three round decision. Brendan Cadwallader picked up his first MMA win with a text-book back take to TKO victory. Nemesis returns June 22nd to Casa Loma.